If you live in a humid area, you have probably already seen dark or otherwise discolored streaks or patches on your roof – a roofing problem that is very common is areas where the humidity in the air reaches prolonged high levels. 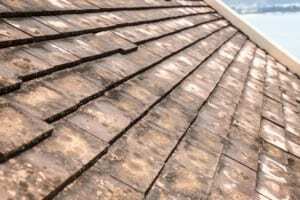 The problem can affect almost any type of roofing, clay and cement tile roofs as well as asphalt and wood shingles and it can cause very severe damage in a very short time, so it is very important to understand the causes and to know the remedy. Most forms of roof mold are caused by mold spores that travel in the air and settle on roofs that are already damp and exposed to very small amounts of sunlight. Limited exposure to light can be caused not only by large trees above the roof, but by the debris that accumulates on the roof over time – the dust, dirt, dry leaves, twig and other detritus carried by the wind absorbs moisture and keeps it in, preventing the roof to dry properly after rainy period and creating an environment for the proliferation of mold. Roof mold is both unattractive and dangerous, but the good news is that it is easy to get rid of. Thorough roof cleaning and the repeated application of a mold-removal substance can usually help Colorado Springs roofing company techs restore the roof to its original state and with a little bit of attention and maintenance, you can keep your roof permanently mold-free.